In 2008, after his first show, Russian designer Gosha Rubchinskiy told a journalist "in 10 years, everyone will be talking about Gosha." He was wrong, but only in the sense that it took two years less than he thought for everyone to be excited about this subversive designer. It was in early 2016 that people really began talking about him. You might not realise it, but Gosha has had a massive impact on the fashion industry and how we dress, particularly when it comes to streetwear. We've already mentioned before how big the streetwear trend has been this year, and among others, Gosha has been one of the key influencers. You need only see his collaborations with the likes of Burberry and that he's already gained an A-list following to see his influence. Want to find out more? 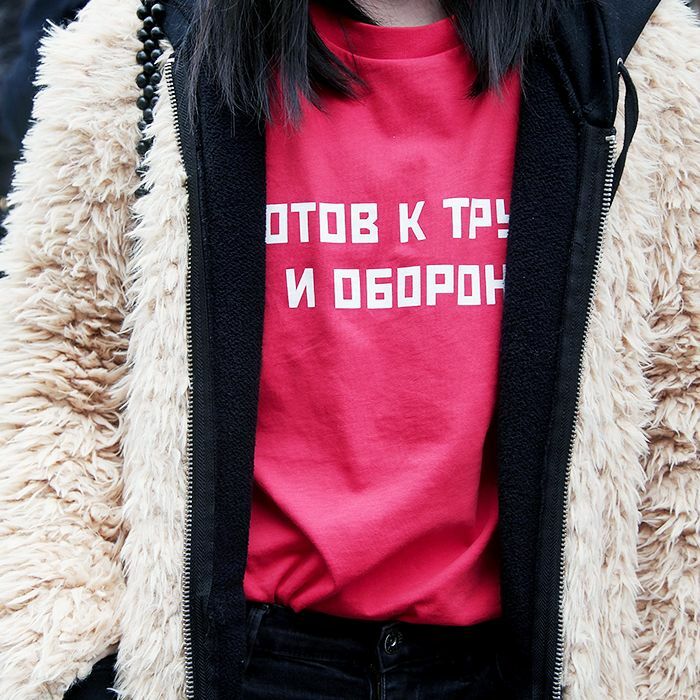 Keep scrolling for our 101 on Gosha Rubchinskiy. Gosha has tried his hand at many creative areas. As well as fashion, he's also a photographer. Born in the '80s, his whole aesthetic focusses on a post–Soviet Russia (after 1991) and the youth culture that surrounds it. From raves to skateboarding, he takes his inspiration from various different sources. His first collection was presented in 2008, which he told the Business of Fashion was very DIY. "We started from making T-shirts—very cheap—and we bought Fruit of the Loom sweatshirts and put embroidery on top. Very DIY. A friend of mine helped to fund the first collection, and we made some shirts and denim jackets." By 2012, however, he'd started working with Commes des Garçons. From there his career exploded, with his own label being owned wholly by CDG, helping to put out his pieces and give him the financial support he needed. Adrian Joffe, CDG president, said that the reason Gosha has done so well is because of his authenticity: "Lots of startup brands see Supreme and want to do a similar thing, but it often doesn't ring true; it feels fake or contrived. With Gosha, it feels very natural." What sort of pieces does he create? As previously mentioned, Gosha is influenced by post–Soviet Russia so that means taking inspiration heavily from the '90s. Skatewear and streetwear are also a prime focus too, with his wares mainly comprising tees, sweatshirts, joggers and anything else athleisure-related. But when it comes to the fashion industry, it's the slogan T-shirts that have really taken off, with the likes of street styler Pernille Teisbaek wearing his pieces. However, Gosha insists on selling his clothing at affordable prices so that his teen followers will also be able to afford the label. Most recently, for his S/S 18 collection, he collaborated with Burberry, which was inspired by rave culture and also football fans. Other than fashion season regulars and street style favourites, Gosha has steadily gained an A-list following. The likes of ASAP Rocky, Kanye West and Kendall Jenner have all been seen wearing his pieces. And with the popularity of streetwear only growing, it might be time to make an investment before everyone else is wearing it too. You heard it here first. Next up, these 42 party dresses are guaranteed showstoppers.